Hogs Back are looking forward to its hop harvest, the brewery is on track for a bumper crop of hops as it enters the all-important final weeks before the 2017 harvest. The Surrey-based brewer is hoping to exceed the 1,100kg of hops that it harvested in 2016 from the 3.5 acre hop garden adjacent to the brewery in Tongham. The four varieties grown are the traditional Farnham White Bine variety, which Hogs Back Brewery has bought back from the edge of extinction, along with English Cascade, Fuggles and a newer hop, Pioneer. The hops are used to brew beers including the flagship Hogs Back ale TEA, as well as English craft lager Hogstar, and single hop beer “Farnham White”, available as a seasonal cask ale as well as a premium bottled ale exclusive to Waitrose. With Hogs Back Brewery celebrating its 25th anniversary this summer, a special Home Harvest Ale will also be brewed once the hops are safely gathered in. Rupert Thompson, managing director of Hogs Back Brewery, said: “Growing our own hops is definitely making us better brewers as well as playing an important part in our commitment to sourcing ingredients locally. Hop garden manager Matthew King is now carefully ticking off the same milestones which have been followed by hop growers in the area since the days when Farnham hops were prized around the world. King adds, “As we approach our third harvest we’re also getting better all the time at understanding the science that underlies these hop growing traditions. The right mix of rain, and sun is very important, and although we can’t do much to control the weather, we’ve further refined the structure of strings and wires the hop plants grow on, as well as ensuring we give the plants and the soil the right nutrients, and control pests and disease. With high global demand for hops from craft brewers, having its own supply of hops is increasingly important to Hogs Back as it continues to develop innovative new beers alongside its established brands. 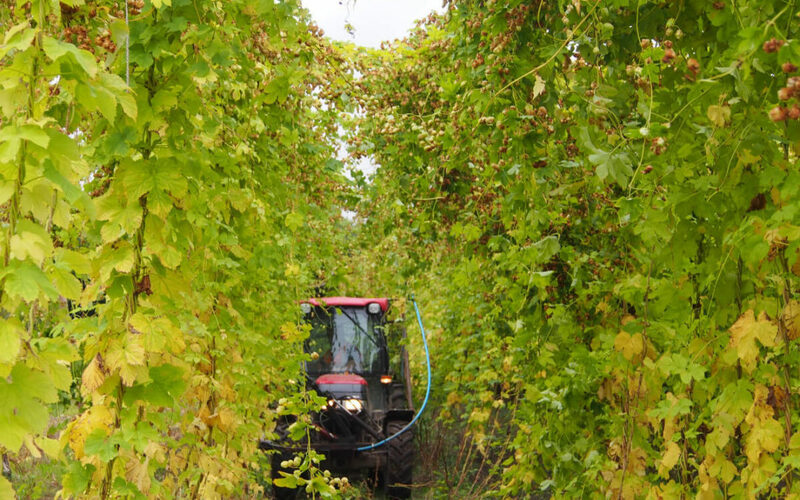 The brewery is working towards growing 25% of the hops it uses in its own garden, and sourcing 70% within walking distance of Tongham. This year will also see the hops dried in a brand new oast house just three miles from the brewery, the first to be built in Surrey for over 50 years.